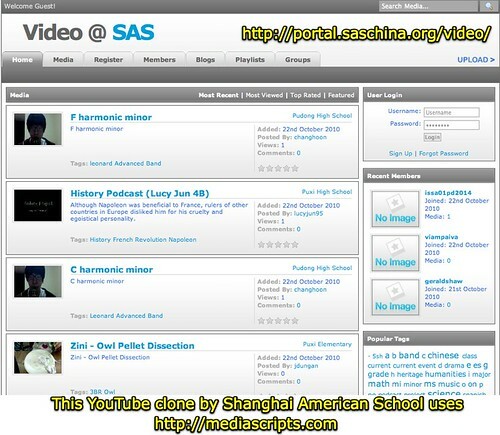 Shanghai American School, a large international school in China, utilizes Social Media by MediaScripts.com for their own, in-house YouTube clone website for video sharing. Their site (portal.saschina.org/video/) not only supports video uploading, transcoding to Flash and playback, but also embedding and commenting just like other video sharing sites like YouTube, Vimeo, Blip, DotSub, SchoolTube, TeacherTube, etc. When Ron Houtman saw this site last week in Holland, Michigan, at the “Teaching and Learning in the Cloud” conference, he thought it might be running PHPmotion. I became aquatinted with the SAS Video Portal last month when I was in Shanghai for the Learning 2.010 Conference. Carol Jordan and I led the cohort focused on Visual Literacy and Digital Storytelling. Quite a few videos from SAS students are included in the wiki site we created for the conference, “Talk with Media.” Thanks to Carol for sharing the software platform for their excellent site with me this past week. For schools with the budget and IT support required, I think it’s a best practice to host a homegrown video sharing portal like this. Doing so provides an automatic answer when students as well as teachers ask the natural question, “Where should I post this video project?” Tags, or keywords assigned to a video at the time it is uploaded, can be used by individual teachers, classes, and student groups to create dynamic, aggregated collections of similar videos. If desired, videos can be shared locally, but by default (hopefully) videos can be shared publicly. Also if desired, videos can be cross-posted to other websites – particularly if they are exemplary. Since the website is hosted locally, performance for uploading as well as downloading/playback should be faster than that of other websites hosted elsewhere. All of these factors can dramatically increase the utilization and publication of the video sharing website by learners throughout the school. As I argued in my featured presentation in Holland Friday, students need “digital sandboxes” for publishing and sharing work. Does your school, school district, regional education support center, or state department of education provide a video sharing portal like SAS for student as well as teacher use? If so, please share the links! I’d love to not only learn about more schools using YouTube clone websites, but also the platforms / software used for those websites. Ideally, like YouTube and Blip.tv, it would be great to use a platform which not only converts uploaded video to Flash but also iOS compatible MP4 format videos which can be displayed on iPads, iPod Touches, and iPhones. Yes that is definitely worth knowing and pointing out! Thanks! Do you have links to any of those sites that are publicly accessible? I don’t actually sorry. It is a very recent development, only this fall. Wesley – completely agreed that students need venues to share their work. Check out our Adobe Youth Voices media gallery at http://bit.ly/aGrWf9 – it contains youth work from across the globe, giving them a chance to share their films and other media projects with a larger audience. This month student work is focused on identity. Great article – it’s good to see schools taking advantage of the amazing learning that online video can offer. Schooleo (http://schooleo.co.uk) offers schools their very own safe, private video sharing site as an out-of-the-box, completely hosted solution – complete with mobile streaming and automatic encoding.